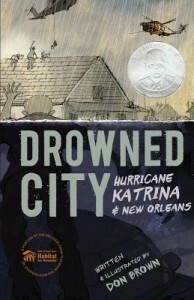 In the graphic novel, Drowned City: Hurricane Katrina and New Orleans the images tell a lot of the story of this devastating natural disaster. What image did you find most powerful and why? This is a journalistic look at the disastrous hurricane that leveled New Orleans in August 2005, brought to grim life through graphic novel style illustrations. A dramatic tale with text that ranges from simple, factual sentences to quotations from an extensive collection of books and media.